Kokusho, The Evening Star (Lead Vocals) needs no introductions. This Burninator is infamous at any multiplayer table and is typically the star of the show. 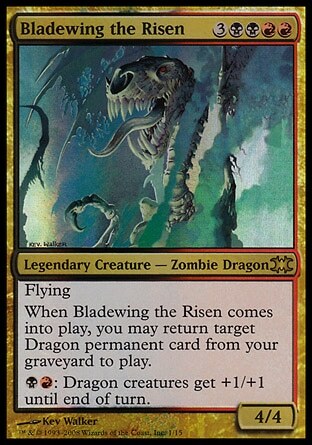 Bladewing the Risen (on Guitar and backup vocals) manages to backup his fellow Dragons. 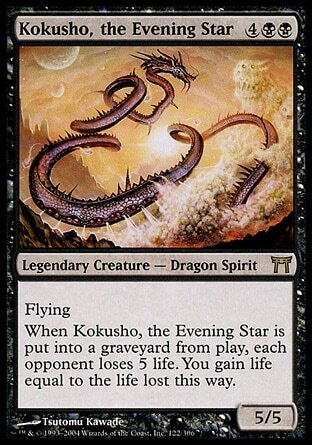 Not only can he reanimate another Dragon (typically Kokusho) but his firebreathing/shade ability supports all Dragons in play. Steel Hellkite (on Bass guitar) is more than meets the eye. No, he's not a Transformer but he is definitely the most Metal of all Dragons! Being colorless, he isn't prone to common Protection spells against Black or Red and his activated ability allows you to deal with pesky enchantments (another thing Black and Red can't do) and other problematic cards. Taurean Mauler (on Drums) is probably the second greatest Dragon ever printed for multiplayer. He may not be capable of flight but he's a powerhouse for obvious reasons. Volcanic Fallout, Soul Snuffers, and Contagion Engine provide a variety of board sweep options. These Dragons require a lot of feeding (heavy mana cost) and so you can't let any form of aggro or Token plan get in your way. Steel Hellkite can also join in on the fun as he can take out Token armies for zero as long as he lands a hit on the opponent. Syphon Mind is the primary card draw in the deck and adds some minor disruption. Contagion Engine not only provides board sweep as mentioned earlier but it supports several cards in here. It can combo with Soul Snuffers to kill off every opponent's creatures, it can provide more mana by ramping up Everflowing Chalice or Molten Slagheap, it can pump Taurean Mauler into the stratosphere, and it has one other very crucial function: it allows Sarkhan the Mad to gain +2 loyalty. Since Sarkhan doesn't have any +loyalty abilities to begin with, this is a huge help. Remember the key here: it proliferates TWICE. Crystal Ball allows you to filter your draws and get the pieces you want more quickly. The best part is that it combos very nicely with Sarkhan the Mad and allows him to use his +0 ability without losing any loyalty as you can let him draw land instead of a hefty costing Dragon. Everflowing Chalice helps provide useful mana ramp to speed up the metal riffs. Sarkhan the Mad provides a plethora of utility by cranking things up to eleven. Whether it be free card draw, replacing an opponent's best creature with a 5/5 flyer, sacrificing Kokusho to set off his triggered ability, or providing the biggest explosion possible, Sarkhan's got it all. His ultimate gets abused to its fullest potential in this deck since Taurean Mauler alone can easily be a 20/20 in a multiplayer game if left unchecked. That's not even considering that almost all of the Dragons on the table are 5/5's bare minimum before firebreathing. It's actually rather common to set off his ultimate to kill one opponent before swinging with a couple of Dragons to finish off another. I've playtested this deck for a few months now and it's definitely a force to be reckoned with. The deck not only has all the firepower you could want but it's consistent and fiendishly sturdy. There's tons of card advantage and the deck can handle board sweep like a boss. Kokusho makes people think twice before dare casting removal of any sort, Bladewing returns any fallen comrades, and Lavaclaw Reaches is a powerful sleeper that no one wants to tango with. The only thing I would tweak is adding more Dragons to the deck but there doesn't seem to be any other candidates. I've checked every Dragon and Changeling under the sun and the others just don't seem Metal enough. Maybe a future set will offer up a Lead Guitar player? This is Kylak signing out to feed my Dragons. 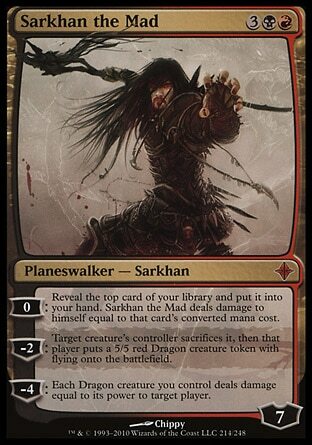 Is it just me or does Sarkhan the Mad look like Nathan Explosion with a goatee?